Each year we are amazed at the number of wonderful customers that take the time to send such kind messages. We are especially pleased that so often they praise our employees. Clarks continually strives to offer the largest selection of quality Corvair parts with superior customer service -Clarks-more than parts! comments: I just wanted to write and give you a AAA rating on the factory like beautiful seat covers that you sent me. I am having my cousin put them on.He has been a upholster for over 40 years and he is really happy with the exact fit and quality of these covers. I just wanted to let you know the upholstery safely arrived today. I am absolutely thrilled with it. I can't wait to see how it looks installed. comments: This is to tell you about the great experience I had using your reproduction of the deluxe FC windshield gasket. The man who installed my windshield said it was the best repro gasket he had ever used on any car. And this from someone with 40 years of glass installation experience! Kudos to Clark's! Just a word of thanks for taking care of me over the years by providing me not only the parts, but the excellent service as well. No matter weather I talk to the tech on hand or the person talking to me on the phone the plain fact that everyone cares and I appreciate that. I just got some parts over the last couple of weeks and got them in a timely fashion and have them installed already. 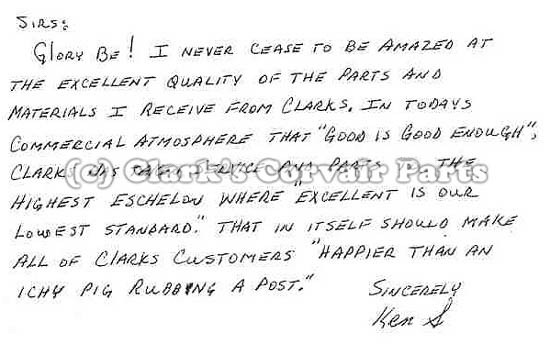 In my opinion, it is important to let people know when one experiences great service, and recently I experienced such service from Clark's Corvair. Some background first. I recently ordered Clark's reproduction knockoffs for the original Kelsey Hayes wire wheels. When the knockoffs arrived last week, I noticed that two of them had what liked like cast pitting on the back side. I sent clarks an email and photograph of the pitting and received an email back from them the next day. They said they would immediately send out replacements, and would include a return shipping label. Yesterday, I received the replacements, and they were perfect. I am extremely pleased. In my opinion, the responsiveness and trust they placed in me is exceptional. I can't tell you how many times I have had companies tell me that they would need to charge my credit card before they would send the replacement item. I either had to send the item back first or have my credit card charged again and then get a refund when they received an item. I like the fact that Clark's sent the replacement items to me no questions asked. I have been a customer of Clark's since roughly 1981 and I have never had a bad experience with their customer service. How refreshing it is to experience this kind of customer service. Kudos to Clark's Corvair! I'll add: Their customer service is exemplary. I had two small issues recently and Clarks took care of the problems quickly, pleasantly, and actually went beyond my expectations to take care of me.